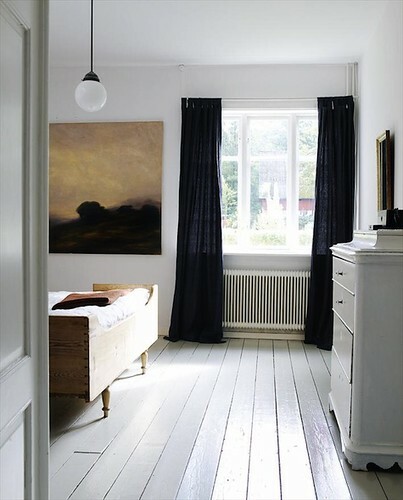 The photos in this post were among my inspirations in deciding to give my own worn tongue-in-groove floors, left, a whitewash. They may look OK here, but trust me, they’re bad in spots, and I just couldn’t get excited about the idea of sanding and refinishing them when I can go all screaming white. You’ll forgive me if I don’t properly credit the rest of the photos, lifted from other websites. Most of those sites didn’t give proper credit, so I don’t know the original sources. 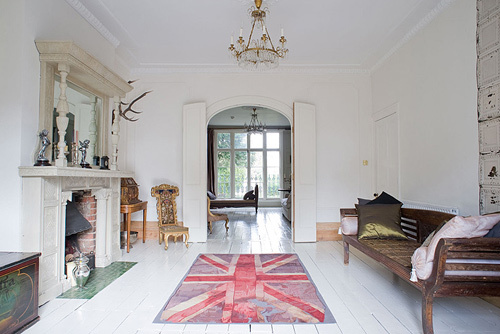 I did note that many of them seem to be of homes in London, though white-painted wood floors are very popular here in the Hamptons, too. I’ve rented out my cottage for the last two weeks of August, and no sooner do I anticipate some extra income, I make plans to spend it. 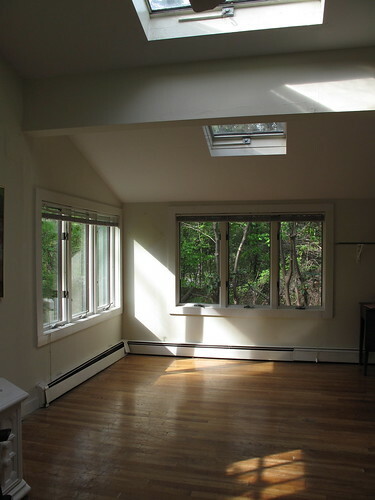 Of the three main items remaining on my wish list (painting the floors, a new kitchen counter, and glassing in the screened porch to create a year-round room with fireplace), the last is too major to contemplate immediately, and of the first two, it’s the floors that bother me most. So next Monday, a painter is coming to move all my furniture out to the back deck (weather permitting) or onto the screened porch (weather not), sand the sad floors down, and give them two coats of white paint for that clean, beachy look I covet. 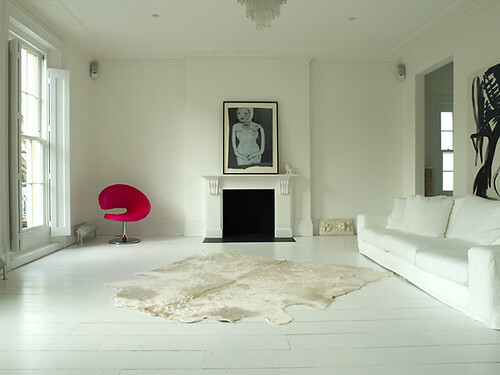 To see more pictures of white floors, go here, here, and here. I’m lovin’ it already. What do you think? This entry was posted in COTTAGE LIVING, HAMPTONS, INTERIOR DESIGN, LONG ISLAND, OLD-HOUSE MAKEOVERS and tagged beach cottage, beach house, beachy, CasaSugar, cottage, East Hampton, for rent, painted wood floors, painting floors, Remodelista, rental, Springs, tongue in groove, white floors, white painted floors, white wood floors. Bookmark the permalink. Go girl!!! Onward to the white beyond!!! Let me know the color and brand of paint. We’ve painted 3 of our wood floors. One more to go. The others have faded enough that we going with and \obviously different but not too different color. We hear that “chalk” paint covers without so much preparation. We had 60 year old wax seeping up from the cracks causing paint bubbles for weeks. The easiest was the one with “recent” polyurethane, I didn’t prepare it at all just cleaned it. We did this in our Brooklyn apartment. Everyone said we were crazy, and I mean EVERYONE. And yet, it’s the very first thing that people comment on when they walk through the front door. It’s been 3 years or so and we really do need to repaint, but I am soo happy we did it. And for the record, Clorox clean-up is really the only thing I’ve found that helps us keep it really clean. We buy the big bottles and then use a swiffer to spread it around. 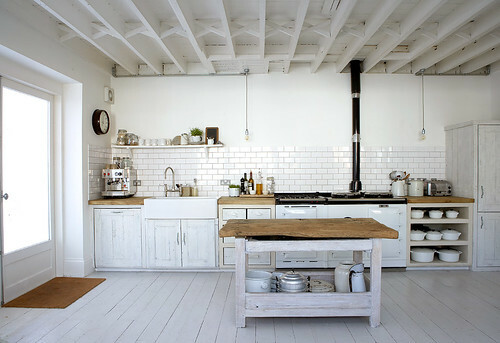 Yay for white floors! Yay indeed, Effed. I keep hearing “So hard to clean!” but I’m ignoring it. I don’t mind it looking a bit distressed, either. Thanks for the Clorox tip. hi Terry. I’m going to use the same stuff I used in the guest room when I painted that floor white (test case) last year. https://casacara.wordpress.com/2010/03/05/painters-progress/ It’s True-Value hardware store brand (don’t know if you have that in Atlanta), “Painter’s Select” Porch & Floor, and the color is Sand Powder, satin finish. It’s not bright white, maybe a tad on the warm side. Anyway, I like it and it went down beautifully. No, Effed, hadn’t heard of Break-through paint. I’ll be outta here for a few days while the painter does the job, so I don’t much care if it dries in 3 hours, as long as it’s dry by the time I get back! I did check out the post you provided a link for, though, and I am filled with admiration for her do-it-yourself spirit. And thrilled I won’t be doing it myself this time around.